OTR tires are largely used in heavy duty vehicles for off-road applications in mining and construction industry. Growth of construction industry in developing countries has bolstered the demand for construction and material handling equipment and is likely to impel the growth of OTR(off-the-road) tires market significantly. Moreover, different regional organizations and national governments are increasingly focusing on enhancing the benefits from mining sector investment, which is resulting in increased mining activities across the globe. The growth of mining and construction industry is the major factor accelerating the demand for OTR tires around the world. 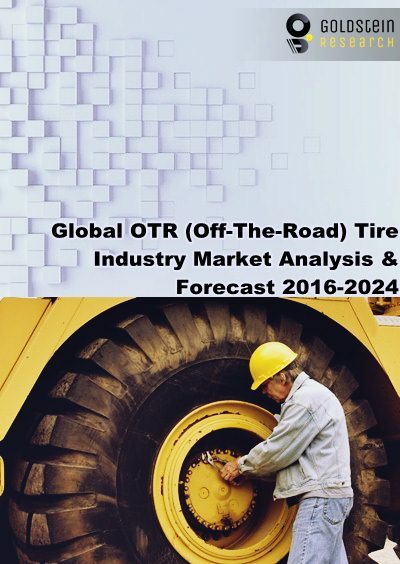 Goldstein Research analyst forecast the global OTR tires market to grow at a CAGR of 4.2% during the period 2016-2024. Further, the global OTR tires market is predicted to reach USD 34.5 billion by the end of forecast period. Geographically, Asia Pacific region dominated the global OTR tire market, accounted for more than 28% of total revenue share owing to huge government expenditure over mining sector and rapid urbanization. Asia Pacific region is anticipated to be the fastest growing OTR tire market, which is likely to expand at a CAGR of 5.2% over the forecast period. Western African countries such as Ghana and Guinea among others provide immense opportunities for the growth of OTR tire market as the region is witnessing significant growth in mining sector and increasing investment by the regional governments in the region. On the basis of end users, construction and mining industry dominated the global OTR tires market with more than 60% market share in 2016. The segment is projected to remain dominant over the forecast period, with CAGR of 5.0% over the forecast period. According to our global OTR tires market study on the basis of extensive primary and secondary research, one of the major trend that driving the growth of OTR tire market is advancement in OTR tire technology such as radial tires and non-Pneumatic tires. Bias or cross-ply technology is an old manufacturing technology which is getting replaced by radial and air-less tires owing to their superior quality and longer life-cycle. According to the report, major driver in OTR market is rising construction and mining activities in developing regions. Global construction market is all set to grow by 85% to USD 15.5 trillion worldwide by 2030, with three countries, China, US and India, leading the way and accounting for 57% of all global growth. The escalating construction and mining sector will augment the demand for material handling equipment and related components. Further, the report states that one challenge in global OTR tire market is shift of energy sector towards renewable energy generation which is expected to adversely impact the growth of coal and other non-renewable fossil fuels mining activities. The report covers the present ground scenario and the future growth prospects of the global OTR tires market for 2016-2024 along with the total sales of OTR tire products in every region. We calculated the market size and revenue share on the basis of revenue generated from the sales of OTR tire to various end user industries across the globe. OTR Tires Market Report has been prepared based on an in-depth market analysis from industry experts. The report covers the competitive landscape and current position of major players in the global OTR tire market. The report also includes porter’s five force model, SWOT analysis, company profiling, business strategies of market players and their business models. Global OTR tire market report also recognizes value chain analysis to understand the cost differentiation to provide competitive advantage to the existing and new entry players. Our report comprises of the following companies as the key players in the global OTR tires market: Bridgestone, Michelin, Goodyear, Yokohama Tire, China National Tyre & Rubber, MRF, Continental, Belshina, Cheng-Shin Rubber, Eurotire, Linglong Tire, BKT, Alliance Tire Group, Doublestar, Triangle, Fujian Haian Rubber, Prinx Chengshan, Apollo, Pirelli, Double Coin Holdings, Maxam Tire, Shandong Taishan Tyre, Shandong Yinbao, JK Tyre, Techking Tires, Hawk International Rubber, Dunlop.